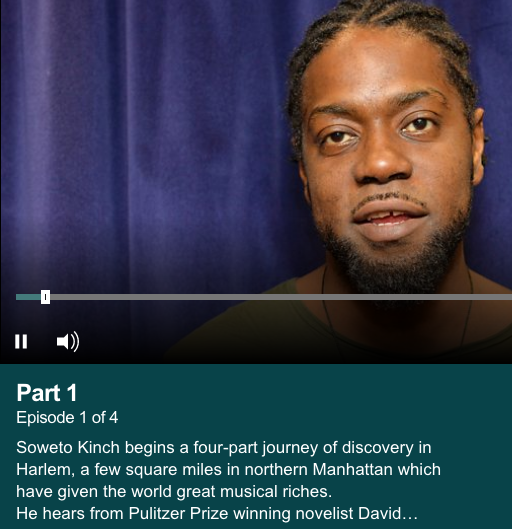 Soweto Kinch - his personal journey to discover the story of Harlem, its music, politics and culture. He meets record producer Paul Winley to discover how doo-wop became hip hop. Kurtis Blow and Zulu Jeff explain how hip hop spread to every corner of Harlem and Soweto also encounters break dancers and DJs. Soweto sees that Harlem's cultural future is assured, with a visit to the National Jazz Museum in Harlem which conserves the rich musical legacy of the area. He also joins in a jam session at Bill's Place, a venue styled after the speakeasies of 1920s and 30s Harlem. The journey ends at the marvellously preserved art deco Lenox Lounge, scene of many a recent movie, where jazz and blues remain a central part of Harlem's rich cultural atmosphere.